One third of CO2 emission, which is one of the most important global environment issues, is reported to be owing to building sector. 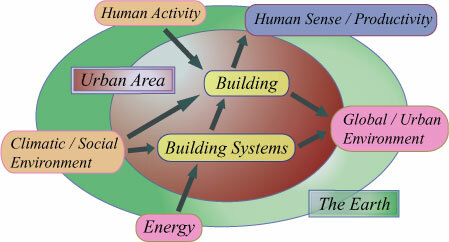 Especially the emission during building operation phase is enormous compared to construction phase, therefore, research work related to energy conservation and utilizing of natural energy in building service systems and building itself is a key subject of urban environment in the 21st century. Furthermore, people in all over the world are gathering toward city areas and it is expected that 60% of population will live in urban areas sooner or later. Therefore we should focus not only on single buildings but also on urban and regional infrastructures and environment, and create a safe and sustainable society.